Your daily fat intake on a plate. Man threw it together one morning while I slept in. Both the sleep and the sandwich are a rare treat. Man says they make BLATs at the station. Man says firefighters do not make brunch. Cut open an avocado, leave it in the skin and slice it, then scoop out the slices with a large spoon. Pick your poison to slather on your toast and assemble to your liking. I prefer bread, ranch dressing, bacon, avocado, tomato, bacon, lettuce, ranch dressing, and bread. 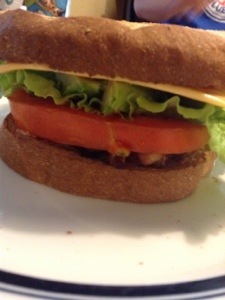 Man likes his BCLAT – with a slice of cheese. A sandwich with some muscles. 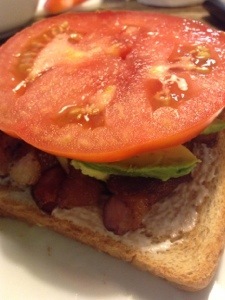 A little naughty bacon, a little healthy avocado & tomato.